Norah Jones came into our program because she was at risk of being sent to a kill auction. Though someone purposely bred her, she was not educated. For most of her life, she was nothing but a pet. 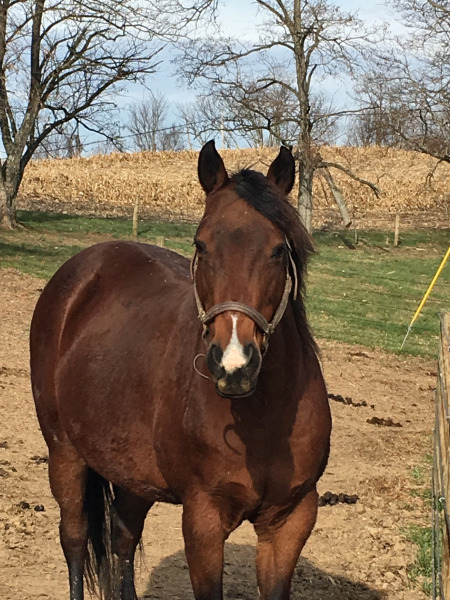 Looking at her, you can tell that she is a well-bred mare, and now we are adding the education to match! Now at Bella Run, she is learning how to be a sophisticated lady. She is curious and very smart, and seeks out humans for attention. Halter breaking her was a snap, and she now is super easy to catch. We can handle her feet and lead her. Once her hooves (which were not trimmed in over 10 years) are fully rehabilitated, she will begin her under saddle training. Norah is cute as pie and has the sweetest personality to match! Norah is doing GREAT! She is currently in training with our friends at Painted Lady Horsemanship and will be carrying a rider very soon! Her mind is ACES and it’s impossible to not fall in love with her! It has become aparrent that a previous injury is going to sideline Norah’s under saddle career. She is still comfortable as a pasture ornament and because of this, her adoption fee will be waived to an appropriate home.